Seattle Sounders FC, the 15th team to join MLS, will begin play in the 2009 season. The name ‘Seattle Sounders FC’ was announced on April 7, 2008, along with the team logo, colors and badge design in a presentation held at the Space Needle. Loosely resembling a heraldic shield, the new badge over the heart consists of two layers representing the partnership between the ownership, the community, the players, and the fans. The logo incorporates the Space Needle, a universally recognized Seattle landmark. The official team colors are Sounder Blue, representing the waters of the Puget Sound; Rave Green, representing the forests of the Pacific Northwest; and Cascade Shale, representing the Cascade Range to the east of Seattle. As most adidas officially licensed team jerseys, this one is made with ClimaCool® - the advanced material engineered to reduce heat and moisture build-up, allowing increased comfort and performance, and mesh panels – to keep you feeling fresh no matter how long the big Sounders match goes on. 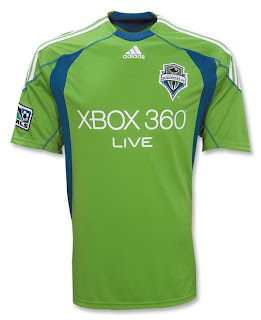 The jerseys features the familiar XBOX 360 logo on the center chest, representing the landmark multi-year sponsorship deal between Seattle Sounders FC and Microsoft Corp. and Xbox 360 video game and entertainment system worth $20 million over 5 years. Xbox 360 also will be featured as the presenting sponsor of the Sounders FC annual international tour and will gain entitlement to the team’s playing surface, "The Xbox Pitch at Qwest Field". Xbox 360 will be recognized as the official and exclusive video game console of Major League Soccer. 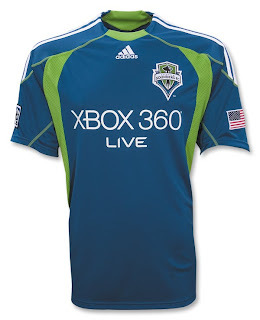 Sounders FC will debut these awesome new jerseys when the team hits the field for the first time in the Spring 2009. But just who will be the coach of the team? Stay tuned to find out. Why do Soccer Players Keep Changing Numbers? What do Vapor Citron and Charcoal have in Common?